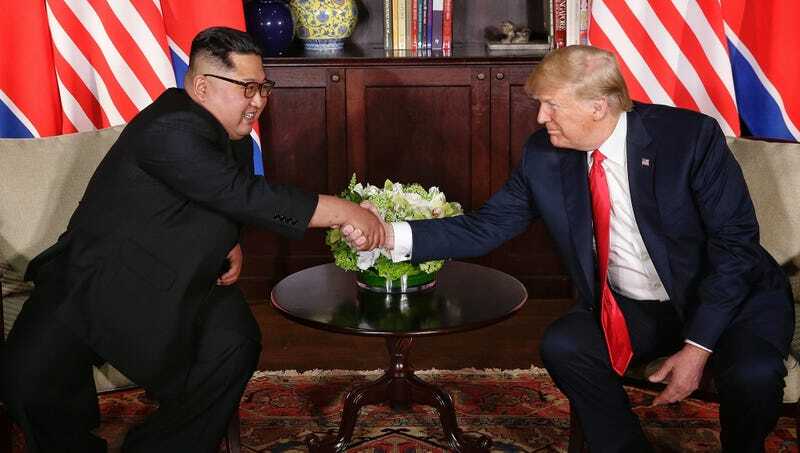 It seems as if Donald Trump’s brash, unpredictable approach to foreign diplomacy is finally paying off in a big way, as the president just successfully reached a deal with Kim Jong-un to end the U.S.’s nuclear weapons program in exchange for reduced sanctions on North Korea. After a marathon closed-door meeting Tuesday, a smiling Trump emerged with news that he had struck a landmark deal with his long-time adversary, the terms of which require the U.S. to provide billions of dollars in annual economic aid and sanctions relief to North Korea under the condition that the U.S. carry out a complete and irreversible dismantlement of the American nuclear weapons program. According to reports, the typically recalcitrant Mr. Kim was reluctant to agree to President Trump’s terms, but ultimately relented after Trump demanded that the North Korean government also accept a gift of 500 tanks from the United States military. Wow. While many have been skeptical about Trump’s ability to resolve international conflicts, the president deserves major credit for securing this agreement and moving the U.S. toward a more peaceful future. It looks like President Trump truly is the greatest negotiator alive!